I have completed the recap-review for Red Sky At Morning. You can read it below! Where we last left off, Clarke and her clan were in complete awe as they surveyed Luna and the oil rig in which her people lived on. However, that is tossed aside as the prerogative of seeking Luna is to have her ascend the second AI and become the new commander. And to stop ALIE. She rejected the “Flame” so what makes them (or say Clarke) believe that she would change her mind now? Luna wants to live in a world of peace, without fighting, or killing, able to express vivid emotion, and after all that was played out, who can blame her? It is a pretty smooth life for the people who wanted to leave behind original beliefs to start anew. That is until, ALIE arrives and disrupts the who peaceful and love montage. But, before I can address that, let’s talk about Luna, as she is one of the most spoke and “hidden” characters since season one. Now, that she was properly and ingeniously introduced, she has a back story. Luna was the last of the Nightbloods, but she fled the conclave, not because she would have lost, but she would have won. To make a very prominent point of this, she flips Clarke over when she tries to insert the AI without Luna’s consent. She shares to Clarke that she killed her brother in the first round, and had not have fled, she would have killed Lexa. Hmm, I simply cannot image a world without Lexa. Prior, Luna also stated that Lexa was Titus’s favorite, and somehow sensed that Lexa meant something to Clarke. Clarke simply replies, “Lexa was special.” That she was. Here is when things get real interesting in the Floukru’s humble home, er, oil rig. Only, it is not so humble. ALIE has now taken control, and has already distributed keys to some of the people. In fact, when Jasper takes a stroll with a new girl, Shay, whom he met earlier around the rig. It is obvious that he is smitten, and is smiling again. When they are encountered by ALIE, a couple of chipped guards, they try to escape. Unfortunately, Shay is arrowed, and Jasper is taken hostage to the machine room. Oy vey. The machine Room is quite the spectacle, as a chipped guard tries to kill Luna by drowning her. She is oblivious to what is happening, and is afraid. The guard will not stop, unless Luna takes the Key. Her companion, Derrick is beside himself in horror as he watching the event. He takes the Key, in exchange for Luna’s life. Yet, it does not roll that way. He fights her to take the Key, and using her incredible fight skills (Honestly, the chick has moves) Luna beats and kills him in self-defense. Clarke, Bellamy (whom is comforting a girl that Luna loves like a daughter), and Octavia charge in, after a dying Shay unlocks the boat where they were locked in, and they witnessed Derrick’s passing, and Luna’s profound grief. Octavia helps Jasper from the tie-up, and when he asks about Shay, Octavia just shakes her head, and says that she sorry. “It’s what we do,” Jasper answers, as if dismissing it. 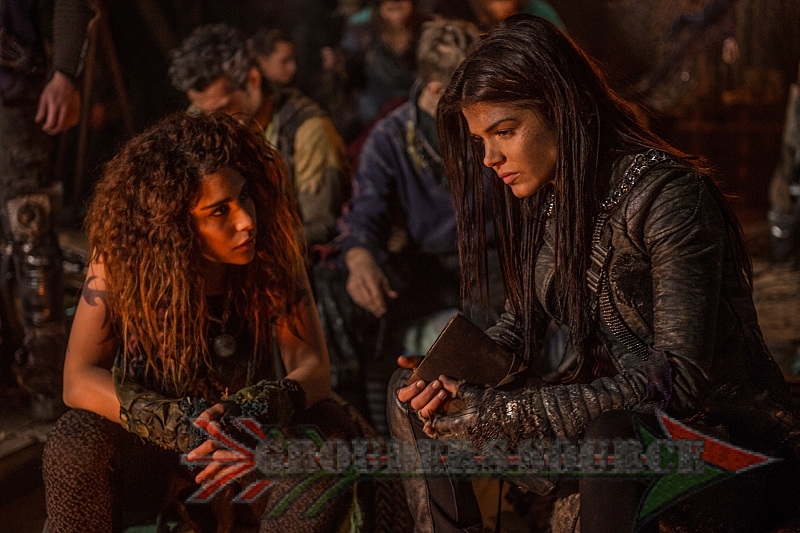 That is one thing that I have noticed throughout the three seasons, is that both Skai Kru and Grounders (except Luna), do not physically emote grief, but it is done internally. Thus, the severe breakout of PTSD, and other mental issues. This is highly common during war and tragedy. Luna appears like that she is preparing for her AI ascension, but it is for the funeral of the three people who passed. When Clarke prompts her that the ascension has to be done privately and quickly, Luna rejects it. In other words, she does not want to become involved with their problem. Yet, I don’t know if she fully comprehended the situations prior, but if she did, then she would not have changed her mind anyway. The squad drinks some of the punch that puts you in sedation, and now, they are back where they started from, the burial ground. After the failure of Luna, what will they do now? In Polis, ALIE has taken over the capital, and is still after those who denied the Key. In a crazy twist of events, Pike is working with the Grounders (Indra tried to get her revenge) to stop ALIE, and save both of their people. Who would have thought? So, when ALIE brings in guards into the cell to see if anyone changed their minds of joining. Nope, and Indra does amazingly awesome killer moves and kills two guards. Now, knowing that this fight is indeed real, she has no other option but to join Pike and Murphy to deactivate the evil AI. Yet, ALIE fights back, with a weakness. She uses Emori (whom by the way, looks resplendent in forest green, and she would not change herself), to manipulate Murphy. Indra, Murphy, and Pike have decided to destroy the mobile backpack as it is one of ALIE’s mainframes. Emori’s seductive flirtation and manipulation falls dead as Pike destroys the pack. Yet, it is too late as the migration is completed, and the whole thing was done in vain. Yet, I am impressed how Richard Harmon can unfold so many layers in just a fraction. He really cared for Emori, but I guess in the midst of a war, you can’t let those caring feelings become a boulder. Oh, and Indra never did use the gun. In Arkadia, Raven is trying vigorously is decode the mainframe, ignoring Clarke’s order of not doing so until she comes back. She works nonstop, looking, and processing codes, which to the naked eye and the unknown, it gives the impression of just alphanumeric characters and symbols. However, they represent how a digital body works, and those who know how to execute code, can dive into the root of the problem. Raven gains access by using the admin login Bekka created, and ALIE does not like this. It is delaying the migration, and she cannot really depart from the Arkadia mainframe system. So, what does she do? Since Monty (He had a happy few moments with Harper!) is assisting Raven with the process, ALIE gets his mom. Now, for a second there, I thought that were going to pull a “Jon Snow, from Game of Thornes,” by bringing Hannah back to life. Well, she is just a coded figure, with a voice, and she tries to convince Monty not to continue the hacking. Yet, he asks Raven what will happen if he deletes her. Well, Hannah would be gone. Unless, you do a “Control/Command Z,” to undo the last input, but it is not likely here. Then, Raven finds something exciting! She discovers that there is a “kill-switch,” and it will all be over. Before she can hit “enter”, ALIE removes herself from the mainframe! NO! It seems like all of that hard work, effort, and progress was all done for nothing. But, at least now, there is a “kill switch.” Monty is livid, but I believe that he is angrier at himself for “killing” his mother again more so then he is at Raven. With two failures, how will they conquer ALIE now? What will our heroes do? What boundaries are they willing to go, in order to deconstruct her? What will be lost, and what will be gained? Is there any hope? Even the most minuscule? That sums it up for Red Sky At Morning. Next week, (May 12th) will be the first half of the season three finale! I am anxious to see what will be the closing chapter of season three. That is, I don’t die beforehand trying to overanalyze! Sinclair’s forename that we found out is Jacapo. I am not too keen on it, but since it is a form of James, I guess I will accept it. Part of the episode was filmed and shot in an abandoned factory. Luna explained that when people come into her clan, they want a better life, without violence. Luna seems to be the first character to really express her emotions and grief. The potion was given so that the location of the oil rig would be kept secret and confidential. Both Bellamy and Luna have a tenderness for children. 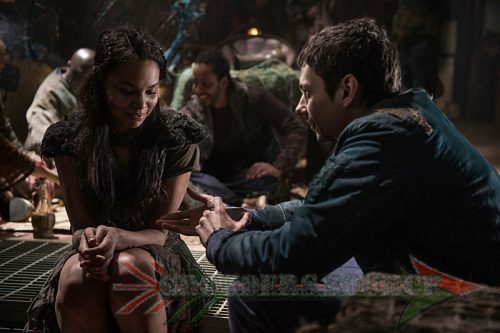 Bellamy, we knew back in season one, and Luna seems to have a mother-like bond with the FlouKru children. The title of the episode is from an ancient mariners’ rhyme. “Red sky at night, sailor’s delight! Red sky at morning, sailors take warning.” The rhyme is about unprecedented weather forecasts at sea. Generally, when you have a red sunset, it will be clear day. If the sunrise is red, then danger is along the horizon. How accurate is the folklore though? Well, maybe be today’s standards it will not be the greatest assessment, with all of the superior “technology” giving more accurate predictions. Years ago, this was something that was considered useful.